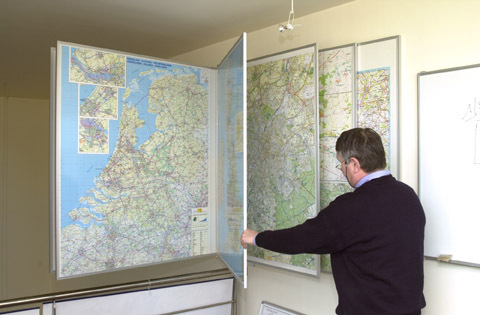 The swivel system comprises double sided boards, laminated with a write on/wipe off U.V. protected laminate and supplied in a soft-line profile. All necessary fixtures and fittings are included. Boards are always the same height and are mounted on the swivel system. 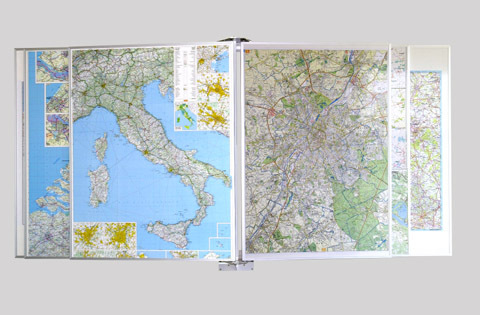 The width of the swivel board is determined by the width of the map. You can choose the order in which the maps appear. The Swivel Unit turns at 180°. You can choose 2, 6 or 8 boards. we recommend the swivel unit for 8 boards.